Life has been crazy busy lately. You would think this is a good thing, but all I can think about is how Thanksgiving is right around the corner and then its nonstop chaos until 2011 arrives. Three weeks ago was Brent’s birthday, two weeks ago my dad was in town, and last week we went out of town for a lovely little vacation. And now the next week or so will be trying to catch up with life and focus on checking off about 167 things off my 500+ to do list. I’m ok with that, I love checking things off my TDL. I made this dish for dinner while my dad was in town. During his stay I didn’t want anything that took too much time away from chatting over a couple of cups of coffee with him. It’s actually my version of a Giada DeLaurentiis dish that I saw her make many years ago. So many in fact that this was the first meal I ever made for Brent (which I forgot actually), but he kindly reminded me of this as he ate it. 1. 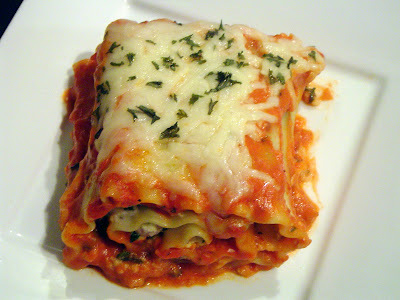 Cook lasagna noodles according to package and drain when done. Separate noodles and lay flat to cool. 2. Squeeze excess water from spinach. In a large bowl combine: spinach, prosciutto, ricotta, parmesan, 1 cup of mozzarella, heavy cream, garlic powder, onion powder, Italian seasoning and pepper. Mix well to incorporate. 3. In a separate bowl combine alfredo and marinara sauce. 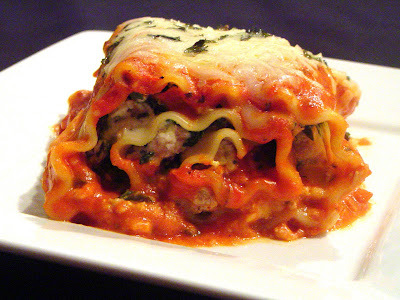 In a shallow baking dish ladle a generous layer of sauce on the bottom. 4. Take each lasagna noodle and lay flat. Spoon a generous amount of mixture and spread evenly over noodle. Roll lasagna up and place seam side down in dish. 5. Spoon remaining sauce over lasagna rolls in dish when finished and top with remaining mozzarella cheese. 6. Cover with tin foil and bake at 400 for 20 minutes covered. Remove foil and bake an additional 10 minutes uncovered, or until cheese is melted. Thoughts: This was the first time I added alfredo to the dish and I liked it a lot. It made it creamy and added an extra layer of flavor. I used my go to sauce which is Hannaford’s Roasted Garlic. Brent and I are both in love with this sauce. Normally if I use a jarred sauce I need to add a ton of other things to get some flavor, but I use this right out of the jar as is. The spinach really takes center stage in this dish and the prosciutto give a nice salty bite. Rolling the lasagna takes no more effort than making a normal version and honestly I think it’s faster. This would make a great week night dinner and can be ready in under an hour. Plus, it looks cute with the frilly edges! Looks beyond cute (and delicious too)!! This looks mouthwatering! So cheesy and tempting! This looks and sounds absolutely amazing!! Now I'm feeling like some comfort food for dinner tonight!